Most people realize the importance of integrating social media into websites and blogs. By “integrating” I mean putting buttons on your website that make it easy for your visitors to share it with others. For example, on Christian Web Trends we’ve got the Facebook Share and TweetMeme Retweet buttons at the top left of every post. We’ve also got the ShareThis plugin, which makes it easy for visitors to share or save a post to dozens of different social media and social bookmarking sites. But, not all social media buttons are created equal. In fact, lately as I’ve been reading blog posts and trying to share them on Twitter, I’ve been noticing quite a few problems. 1) Too cumbersome. Some social media tools – particularly older versions of the “all in one” sharing tools – are just hard to use. I recently came across a post I wanted to tweet. I scrolled down and clicked the “+ share” button. It opened up an AddThis.com page in another tab. Then to tweet, I had to scroll 4 screens down, find the Twitter icon, and click to open another page. And then click again to Tweet. Ugh! 2) URLs not shortened. This issue is specific tweeting blog posts because Twitter limits tweets to 140 characters and blogs often have really long URLs like https://www.ourchurch.com/blog/2010/10/21/practical-steps-to-getting-started-in-social-media-step-7-finally-incorporate/ It would be impossible to tweet the title and full URL of a post like the Tweet button didn’t shorten the URL. 3) Tweets missing your @username. I see this sometimes when people don’t setup their Twitter button. It can also be a problem with the all-in-one sharing tools. For example, I haven’t been able to get the ShareThis plug-in at the bottom of this blog to include our Twitter username yet. 4) Tweets with @AddThis or @TweetMeme. As with #3, this happens when the button or plugin hasn’t been customized for the website or blog. 5) Errors. Recently when attempting to tweet one blog post, I got the message, “An Error Was Encountered. The short_link field must contain a valid URL.” Errors like this can occur if the button or plugin is not configured correctly. They can also occur if you change the URL of a blog post after it’s been published. 6) No social media integration at all. At this point, if you don’t have any social media buttons on your website or blog, you’re really hindering your visitors from sharing your content, bringing you new visitors, and growing your audience. Test your social media buttons. Have you tested the social media buttons on your site/blog? Is it suffering from any of these problems? What other social media integration problems have you seen? Doh! I meant to email you before publishing, Becky, and then forgot. That's poor way for you to find out. Thanks for being gracious in your comment. I really do like the newer versions of AddThis and ShareThis which pop-up when you mouseover them and have the most popular options at the top (Twitter, Facebook, email). They are not cumbersome at all. What a wonderful reminder to go and check my social sites button again. These are some of the things we neglect but they have far reaching implications. Thank you. One other problem I've been noticing is when I publish blog posts with an ampersand & in the title it prevents the TweetMeme button from working properly. The tweet produced by the button only includes the part of the title of the post up until the & and then leaves out the rest of the title and the URL of the post. Magnificent goods from you, man. 6 Ways Your Social Media Integration May Be Failing You | Christian Web Trends Blog I have understand your stuff previous to and you are just too magnificent. I actually like what you have acquired here, certainly like what you are saying and the way in which you say it. You make it enjoyable and you still care for to keep it sensible. I cant wait to read much more from you. 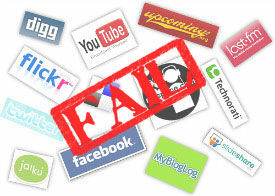 This is really a terrific 6 Ways Your Social Media Integration May Be Failing You | Christian Web Trends Blog informations.